- Support for Action Url to open other applications. Check http://www.handleopenurl.com for more details. - Filter All / Value to show all fields or only fields with a value. 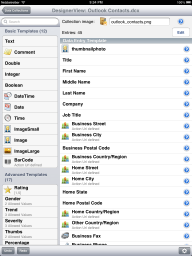 - Fully compatible file format between DataCollector for iPad and FullContacts for iPhone. - Fully configurable copy to clipboard function. Check http://datacollector.simplexity.ch/Downloads/OutlookTemplate.dcx for an advanced example. - Designer View and Additional Settings built in. 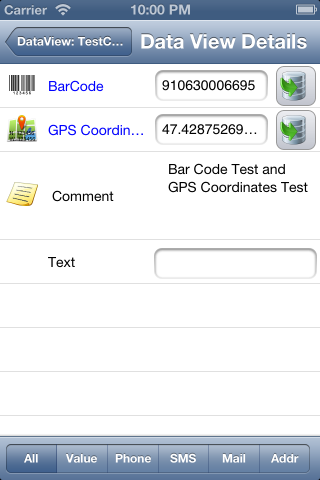 - Full BarCode / QRCode Scanner integrated including BarCode Lookup! - Import of GPS coordinates. - Import/Export your data in the standard xml dataset format or in the old fashioned Comma Separated Values (CSV) file format. - New data import (including Thumbnails) from Microsoft Active Directory Service (ADS) with the Free PC companion App. 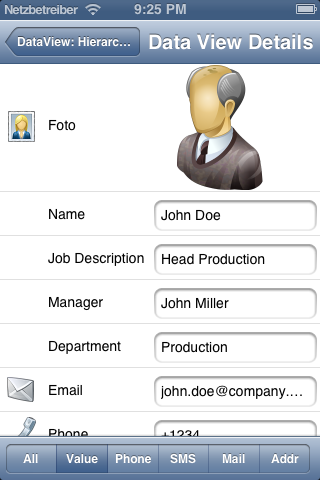 - The importer makes your job easy by trying to figure out the data type and allowed values automatically. - Use iTunes to sync your collections or email the current entry or whole collections in different formats. 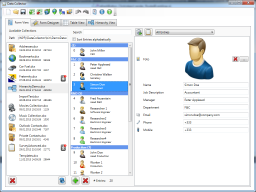 - Use it to define the address book with the entries you really need. - Use it to quickly setup a survey and analyze it with your favorite spreadsheet. 2) Define the separation character for the comma separated files.